Yeah, I am gonna love this. I can make stupid names up for my recipes and take pictures. ok, so my SIL has Celiac Disease. She has really been pretty inspirational watching her tackle the disease. In order to not “out” anyone on my goofy blog, I will give her a code name, because she is awesome and is helping me and I think I will refer to her a lot. Let’s call her Cecille. She is the mother of all mothers in the kitchen. My nephews eat really healthy, will eat anything and she provides a fantastic platform for them. She is essentially everything I am not. She gave me an idea to throw some meatballs together and I tried them. A few things: I can’t cook. I am not good at it. I don’t like it. I f*ck up everything I do in the kitchen. Ask my husband…Thor. My kids think I am Julia Child. Give them a few years. 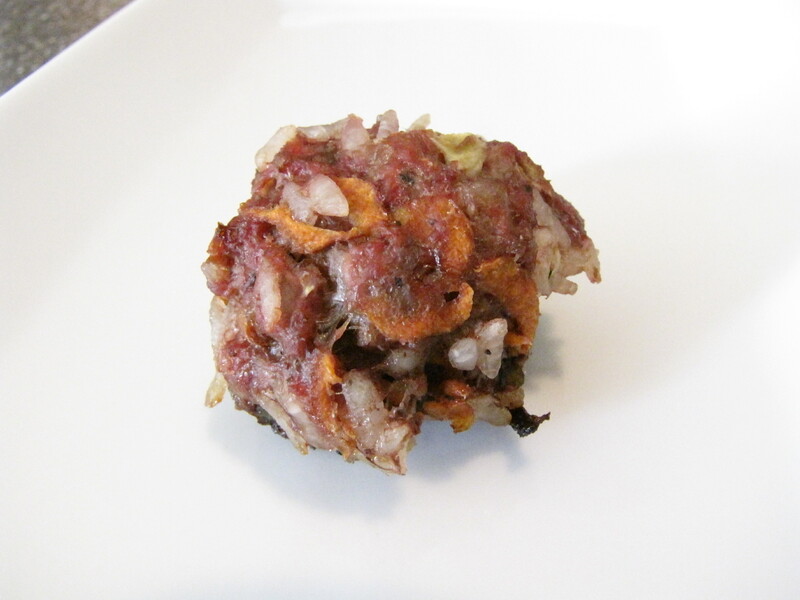 So when I was trying to “throw” meatballs together, I was like…taking food…and like…throwing it. In the bowl. Look. Let’s get something straight here. I am not at a point yet where I can tell you how many “cups” or “teaspoons” of stuff. I am have high hopes for improvement and I just don’t want you to expect much. OK, so I took all that stuff and I threw it in, took off my wedding rings, cleaned my hands and mushed it all together. *Sigh” I miss garlic. Anyway, then I made these little balls and I put them on a Pan-sprayed cookie sheet, secretly wishing they were actually cookies, and then I baked them for 3o minutes. BAM! That looks fricken NASTY! It’s all crooked and lumpy and DAYUM. But seriously? It was really good. And I whipped up a little lowfat sour cream with some chopped fresh dill. I just did a little dollop and it was seriously really tasty. The best thing is that I have about 20 of those little bad boys to keep in the fridge and pop in my mouth whenever I get hungry for the next few days. 1.) Don’t bother buying the $758-a-pound sirloin at Whole Paycheck, like I did. They were a touch greasy and I am a much bigger fan of turkey meat. 2.) Don’t take pictures of food that looks like koala poop. Welcome to Corrections by Cecille. This is where my SIL Cecille reads what I have posted, shakes her head and corrects me. It needs to happen. I am a mess over here. Do NOT make any of my recipes before recieving a Cecille approved update. Things could get messy. ” …cucumber? please tell me that was typo and you used zucchini? you can also use sweet potato and don’t forget some apple sauce or shreaded apples” Now I didn’t use apple sauce because I have another random allergy to that. But that’s another story for another blog. It’s sounds yummy though and adds moisture so go for it. “oh and maybe just stick with one herb at a time, like oregano. (ala italian meatballs)…” …Right. Yeah. (Hard facial shame blush) I am…also new with using the fresh hhhherbs. May be acting a little over zealous with them by adding them all together. Food is tasting slightly like I am gnawing on a bush from the side of my house. Thanks Cecille! first, let me out my wonderful friend, Tracy Nicolas, a.k.a. AWESOME. She is, well, awesome. She did however virtually punch me in gut informing me that SOUR CREAM HAS SULFITES. Going to cry myself to sleep at naptime. So, please replace sour cream above with yogurt! *WARNING: This website is meant to suggest things for people with sulfite allergies. There are many different types and degrees of food intolerences out there,. Many of them can be dangerous. I am, contrary to what you all may think reading my genius blog, I am NOT an expert on this. So please don’t sue. Thank You.